The sun was shining and it felt like spring when I saw this sweet little bag in the op shop last Saturday. When I asked how much and was told $4, there was no way I could leave it behind. It is in near perfect condition, but I've decided to replace the lining with this spot fabric. 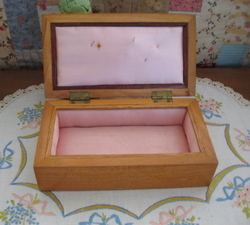 Then I'll have some fun deciding where it should go and what to pop inside. On Saturday I bumped into Michele at Avonleigh. Michele had the 4th Red Club quilt with her and I just had to take a picture. Unfortunately the photo does not do it justice. I love the paisley print for the borders and the grey prints in the blocks. A recent purchase at the local trash and treasure market. I ummed and aahed over it for a while trying to decide if I liked it or not. Mind you it was clutched in my hand the whole time in case anyone else was interested. It was sooo expensive at $5. What was there to think about? What a great weekend it's been. The Cats won the AFL Grand Final yesterday. It's been 44 years since they last won a premiership. They're the only team I've ever followed and I was too young to remember the win back in 1963. Today the girls and I went to the Rotary Market. It's a great place to buy your fruit and vegetables and hunt for a bargain. I'm always on the lookout for tins, wooden boxes, baskets, buttons and anything else that I might find a use for in the near or distant future. 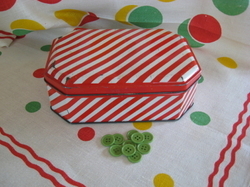 Before we left home I thought, mmm, I'd love to find a red and white striped tin for Christmas. And look what we found just as we were leaving and only $3. It's a Bester's Sweet tin. Does anyone remember these sweets? Thought the buttons were a pretty green and for a $1 does it matter if they're not used anytime soon? The linen tea towel belonged to mum. 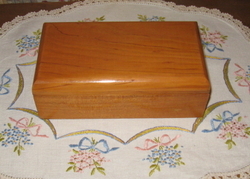 I also found this small wooden box for $5. The name Peter Charles Horn.... (can't read the rest of the surname) 1964 has been written on the bottom so I was a little surprised to to open it and find the pretty pink satin finish. I know boys can like pink too. I'm not saying they can't. Now I guess some of you are thinking 'what great bargains' and others will be wondering 'what was she thinking' but that's why its called Trash & Treasure.